The red pin (below) is Round Rock Bay. Zoom in on the Anguilla map for more detail. That's Round Rock Bay (the area includes smaller bays, like Lockrum Bay). 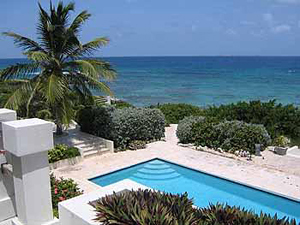 This area is also home to many ex-pats and their elegant Anguilla villas. 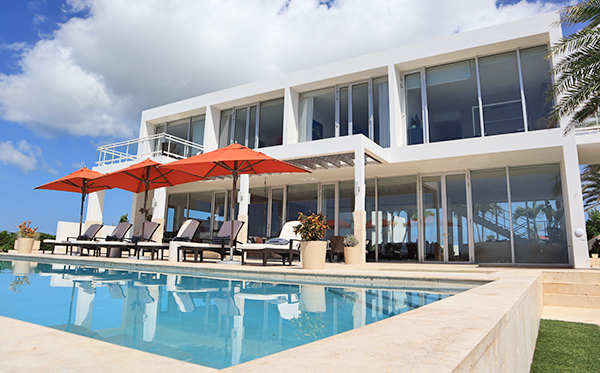 Although the majority of the Round Rock Bay villas are rented privately, there are a few Anguilla villa rentals available. Location: On the Caribbean Sea. Description: Champagne Shores offers exceptional value. Modern in look, Caribbean in feel, here, every need is attended to. For an in-depth look at Champagne Shores, see the video below. More on Champagne Shores: The Villa. Location: On a small, sandy beach in the Round Rock Bay area. Description: Kamique is made up there villas - Triton, Aquamarie and Anani. Triton is the biggest of the three, with 6 bedrooms. The other two have 4 bedrooms. These villas are particularly luxurious, staring out to St. Martin. The way they have been constructed, they have also created a virtually private small beach. Bedrooms have polished wooden floors, vaulted ceilings and clean furniture. The pools dazzle, the modern furniture is eye-catching... the design is simply beautiful and modern, with touches from around the world including Europe, Egypt, and the Middle-East. Location: On rocky ocean front. Description: Moonrise is a comfortable and nicely appointed villa. The design and furnishings blend clean modern and familiar comfort. The outdoor wooden dining table is large and perfect for meals alfresco, with the pool and Caribbean sea as a backdrop. The bedrooms are lovely too, with nice floors and wooden shutters that let breeze flow through the house, naturally. The bedroom with twins is very sweet. The beds are wrought iron and charming. There is an indoor living area and kitchen with dining area. Description: In the Lockrum Bay area, and facing St. Martin, Balihai Villa has pretty views of St. Martin and the Caribbean sea. Interiors are nicely appointed and comfortable. You will find a complete kitchen, dining are and living space. The outside is pretty too, with plenty of shaded space to sit and enjoy the afternoon, and a large cool pool! The whole villa has been designed with a Caribbean flavor. Description: With their fine lines and clean design, Beaches Edge is ultra modern. 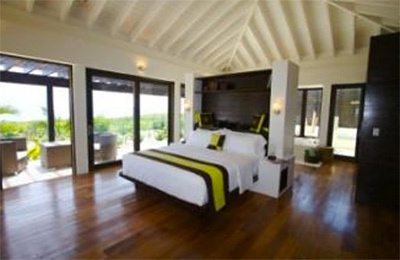 The villa offers an exceptional contemporary feel, accented with warm bamboo and wood touches. You will certainly be impressed as you approach the villas. With pretty gardens, and still, lit-up pools, they are particularly impressive in the evening, reminiscent of trendy homes high in the hills of California. Here, views are maximized. The windows are large! The main living area (with formal dining room) has spectacular views of St. Martin. The pool and outdoor living space are in the foreground of those views. The villa features a media room, and a complete kitchen. Description: Inspired by a Jimmy Buffet song, Banana Wind is built on nearly 200 feet of ocean front, with a private beach at the property's edge. This three bedroom villa has a full kitchen, swimming pool, hammocks, and a southern exposure that will allow you to enjoy cooling trade winds while lounging around in the hot Caribbean sun! Location: On a small, sandy beach. 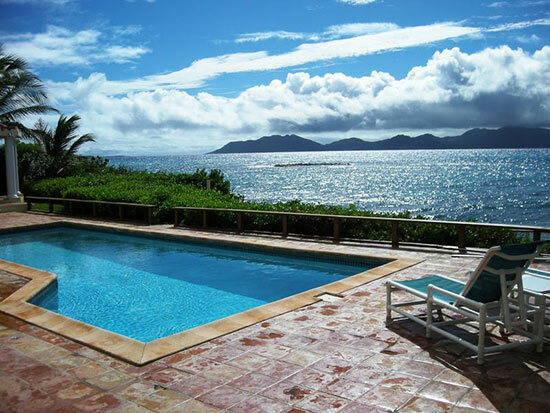 Description: Three Dolphins is an elegant Anguilla villa near the Lockrum Bay area. Warm and inviting, Three Dolphins has a dazzling freshwater pool and jacuzzi and its own sandy beach area for taking a dip in the sea. Lovely amenities are in place including indoor/outdoor showers, walk-in closets, a library, and a gourmet kitchen. A swimming pool, a jacuzzi, a full, gourmet kitchen (poolside and open-air), media room and all of the beach equipment you could need (snorkeling gear and kayaks) can all be found at Three Dolphins. I almost forgot to mention... There is a secluded beach a couple of seconds away by foot. Where else would you use your snorkeling gear and kayaks? Ha ha! 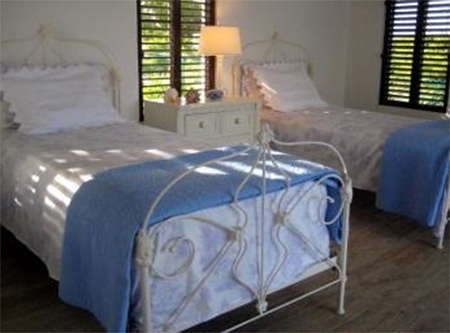 The five-bedroom villa also has permanent housekeeping and grounds staff to ensure a perfect stay.